With much fanfare and a mayoral ribbon-cutting, the small southeast city of Maywood Tuesday celebrated the opening of its first marijuana dispensary licensed to sell cannabis for recreational use under a state law that took effect Jan. 1. Hundreds of people stood in line Tuesday morning outside the newest location of Cookies Los Angeles, awaiting the mid-morning ceremony that opened the dispensary for business. The company also has locations in San Francisco and Santa Ana. By noon, nearly 1,000 customers had been served, according to Cookies’ spokesman Stephan Chavez, of ChavezPR. 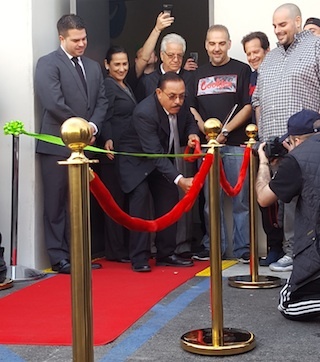 Maywood Mayor Ramon Medina was on hand to cut the ribbon outside the dispensary, which is billed as having the county’s first microbusiness license, with every aspect of marijuana growth, processing, preparation and sale done on site. The dispensary sells both medical and recreational cannabis. “A lot of people are going to be coming here from all over the place,” customer Juan Alvarado told ABC7 as he waited in line at the dispensary, 5815 Maywood Ave.
Maywood, only about 2-square miles in size, has suffered several financial setbacks in recent years, along with allegations of corruption and mismanagement of city funds by city officials. A state audit blasted the city for its lack of control and adherence to standard financial practices. The city was forced to cutback services, layoff employees amid a crippling deficit. City officials, some who initially opposed marijuana related operations, did an about face and have now approved some of the most liberal marijuana related laws in the county. City officials are hoping the dispensary is a big money maker, thanks to a 6 percent local tax rate anticipated to raise at least $1 million annually. Maywood’s mayor told reporters that the city has turned around under new leadership, and that the revenue generated would be used to pay off city debt and restore city services. Although recreational marijuana became legal at the beginning of the year, the permitting process has been slow to materialize in some cities, such as Los Angeles, meaning delays in the ability of dispensaries to sell cannabis for anything other than medical use.